How you set up numbered headings depends on what version of Word you have. This page is about setting up numbered headings in Word 2007 and Word 2010. If you have Word 2003 or an earlier version, see How to create numbered headings or outline numbering in Word 2003 and earlier versions. What's needed is someone to get those mad horn players organized and co-ordinated [Lene Fredborg 12-Sep-2017: linked picture of orchestra removed - picture doesn't exist anymore]. We don't need another player: we clearly have enough of those! What we need is a co-ordinator. In an orchestra, the conductor co-ordinates. For Word's numbering, the mechanism we use to organize and co-ordinate paragraph numbering is a List Style. The List Style co-ordinates. It doesn't do the actual work of formatting text. We leave that to paragraph styles. a paragraph style for each heading level (Word allows, actually requires, 9 levels). A List Style has 9 levels. Each level can be linked to a paragraph style. And, each level stores information about how to number text to which that linked paragraph style has been applied. A List Style actually does two things. There are good reasons for using the built-in Heading styles. 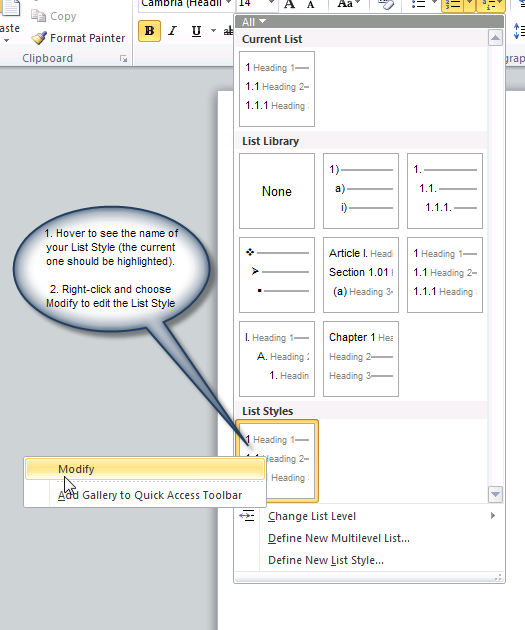 To create your list style, on the Home tab, in the Paragraph group, click the Multilevel list menu (Figure 1). From the menu, choose Define New List Style (Figure 2). Figure 2: On the Multilevel list menu, choose the Define New List Style option. Give your list style a name. Hint: Give it a plural name. That makes it clear that this is a list style that's controlling more than one paragraph style. And, give it a name directly related to the paragraph styles you're going to use. We're going to use paragraph styles Heading 1, Heading 2, Heading 3 etc. So I suggest that you name the list style as Headings. On the Format menu, click Numbering. 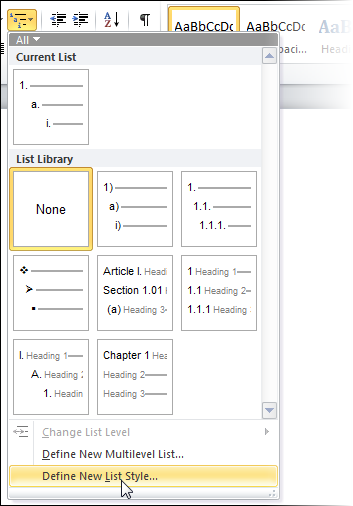 Figure 3: In the Define New List Style dialog, give your list style a name and then click Format > Numbering. Skip everything else in this dialog box. It's not for grown-ups. We're now in the Modify Multilevel List dialog box (Figure 5). The list style is the co-ordinating mechanism for the whole "set" of paragraph styles we'll use. So we set up all levels of numbering in this one dialog box. 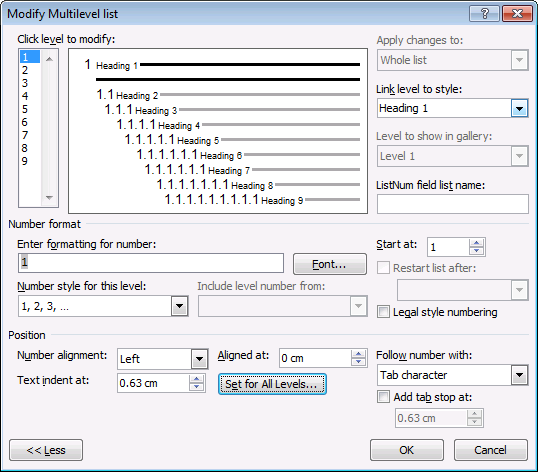 In the Modify multilevel list dialog, click the More button. In the 'Click level to modify' list, select level 1. In the 'Link level to style' box, choose Heading 1. That attaches paragraph style Heading 1 to level 1 of the list style. In the 'Click level to modify' list, select level 2 and attach style Heading 2. And attach Heading 3 to level 3, Heading 4 to level 4 and so on. In the 'Click level to modify' list, click level 1. Delete anything in the 'Enter formatting for number" box. If you want the numbering to start with some text (eg to number a paragraph as "Chapter 1" or "Section 1") then enter the text including any space in the 'Enter formatting for number' box. Leave the insertion point after your text. From the Number style for this level list, choose the kind of numbering you want. Set up numbering for levels 2 to 9. In the 'Click level to modify' list, choose Level 2. 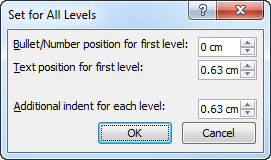 If you want to include a previous level's numbering, then use the 'Include level number from' box. If you want punctuation after each level, add it into the 'Enter formatting for number' box as you go. For example, for Level 2, I might want the numbering to be "1.1". That is, I want the Level 1 number and the Level 2 number. So, from the 'Include level number from' box, I choose 'Level 1'. Then I type a full stop (full point, period, whatever). Then I choose from the 'Number style for this level' box. You have to do each previous level separately. By the time you come to do Level 9, if you want paragraphs numbered 1.1.1.1.1.1.1.1.1, you need to add Level 1, Level 2, Level 3 etc, all the way to Level 8. This can get tedious, but hang in there! From the Number style for this level list, choose the kind of numbering you want for the current level. Repeat for each of levels 3 to 9. If you don't want numbering for a level, leave the 'Enter formatting for number' box empty. Next, set up the indents: how far in from the left margin do you want the different levels to appear? The default indents are actually quite reasonable. If you prefer to change them, then you have two choices. The easy way is to click the "Set for all levels" button. You'll see the Set for All levels dialog (Figure 4). The hard way is to set the 'Aligned at', 'Text indent at' and 'Add tab stop at' boxes individually. Just remember that they're all measured from the left margin. My finished settings look like Figure 5. OK, OK back to your document. So you have set up your List Style. But we don't ever use the List Style. Instead, we format paragraphs using the Heading 1, Heading 2 etc paragraph styles. Because you linked the heading paragraph styles to the List Style, the heading styles will now use the numbering you set up in the List Style. The conductor doesn't produce any sound: musicians do that. And you won't find a part for the conductor in the score. The list style doesn't format your text: paragraph styles do that. And you won't find the list style in the Styles pane. Apply your paragraph styles to text. We don't ever actually use the list style. on the Home tab, click the thumbnail for the Heading 1 style (or, for keyboard junkies, use Ctrl-Alt-1, which is the built-in keyboard shortcut for applying style Heading 1). By default, the heading styles appear on the Quick Styles gallery as you need them. That is, once you've used, say, style Heading 4, then Heading 5 will automagically appear on the Quick Styles gallery. Click in your paragraph, click the thumbnail for the style you want and presto! the paragraph is numbered. Use the built-in keyboard shortcuts for the first three levels of headings: Alt-Ctrl-1, Alt-Ctrl-2, Alt-Ctrl-3. Use the Increase Indent button. It's on the Home tab, in the Paragraph group (Figure 6). And, to promote a paragraph (ie move it to the left), use the Decrease Indent button. Or, for keyboard junkies use Shift-Alt-Right arrow and Shift-Alt-Left arrow. If you click in a paragraph in a Heading 1 style and click the Increase Indent button (or do Shift-Alt-Right arrow), you're not applying some kind of nasty direct formatting. Word will apply style Heading 2 to your text. 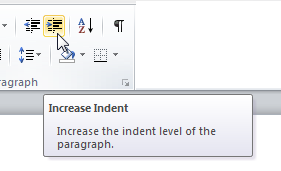 Click Increase Indent again, and Word will apply style Heading 3. And so on. That is, Word is applying the appropriate paragraph styles to your paragraphs. The Increase Indent and Decrease Indent buttons (and Alt-Shift-Left and Alt-Shift-Right) only work in this special way because you attached your Heading paragraph styles to a list style. They don't work like this out-of-the-box. Edit the individual paragraph styles if you want to change paragraph settings (eg space before or after) or the font of the text that follows the heading text (eg to make it big or pink or bold). 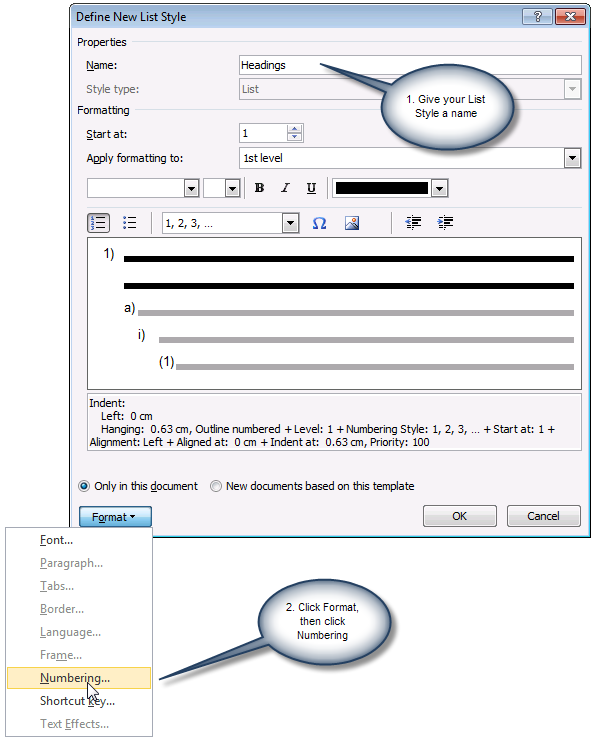 To edit an individual paragraph style, see How to modify styles in Microsoft Word. You will see the Headings list style highlighted at the bottom of the menu. Right-click the thumbnail for the Headings list style and choose Modify. Format > Numbering (Figure 8). You can how change any or all of your numbering settings. Figure 8: To edit your list style, hover over the thumbnails for the list styles to identify the one you need, then right-click and choose Modify. Is all this really necessary? Can't I just use the List Library? If using the List Library on the Multilevel List menu (see Figure 2 or Figure 8 ) works for you, then go for it! For quick'n'dirty work, it may be just the thing. For a corporate template that will be used by hundreds or thousands of users, it's probably not the best solution. For really big complicated documents, or documents where you have to cut and paste from one document to another a lot, then the List Library may let you down. For more information, directly from Microsoft's Word development team, see [NOTE: outdated links removed by Lene Fredborg 29-Dec-2016]The Many Levels of Lists and Multilevel Lists vs List Styles. All sounds too good to be true? It is. When you've finished getting your numbers just right, you might be interested to read some of the material MVPs have put together on numbering. Start at the Microsoft Word MVP FAQ site, click FAQ and then Numbering. And, read from people in Microsoft's Word development team especially Stuart Stuple's The Why Behind Our Styles and Lists Designs. How to create numbered headings or outline numbering in your Microsoft Word document. 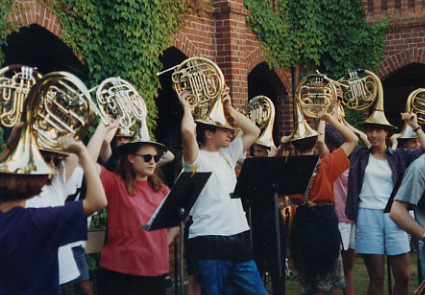 John Curro, conductor of the Queensland Youth Orchestra who taught me more than I'll ever know.